Now play Nokia’s nostalgic Snake game on Facebook in AR! Users can make use of the the Facebook camera to play Snake in augmented reality. Players can control the snake using their facial movements and even compare scores with friends. 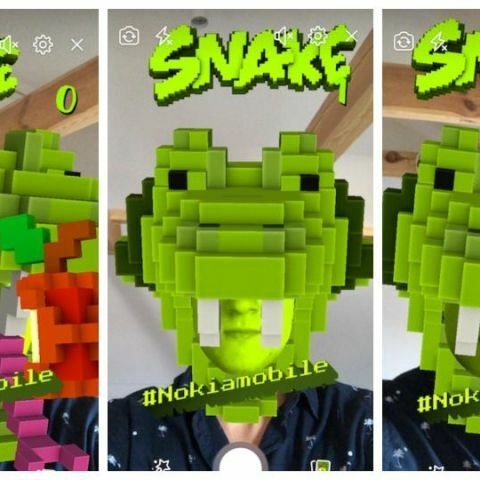 The popular game ‘Snake’ found on older Nokia phones, and now even the refreshed ones, is now available on Facebook’s Augmented Reality platform. Users can make use of the Facebook camera to play the game on their smartphones. Millennials wouldn’t know, but Nokia’s Snake was an iconic game at its time and the only saviour from hours of pretending to study back in the day. At its roots, Snake borrows from a 1976 arcade game, called Blockade. Distinctly similar to Snake, the game was designed for two players and couldn’t be played alone. Snake died a death with Microsoft-owned Nokia and was only recently revived by HMD Global on its refreshed Nokia 3310 last year. The company also made it available for users to play on Facebook Messenger. Now, in a new collaboration with Facebook, HMD Global has announced that Snake can be played on the social media website in AR. Who would have thought a game from 1998 could make a comeback, that too in augmented reality, a concept that was unknown back when the game first appeared on a Nokia device. “Snake Mask and Snake Real World filters bring the iconic game to a new generation of fans,” HMD Global said in a press statement. “The addictive premise of the game remains the same, but with a fun AR twist fans can now be the apple munching Snakes. Snake Mask utilises new Facebook AR technology to bring Snake to the widest audience possible. Snake at the zoo? Snake at the beach? Snake… on a plane? Now it’s all possible when Snake is on Facebook camera. Plus, with Facebook Live integration, it’s straightforward to broadcast gameplay live to the Facebook news feed, allowing friends to join the action,” the company added. The new Snake Masks are accessible through the Facebook app to all Android and iOS phones, not just Nokia phones. Players can turn themselves into the iconic Snake character, which reacts to the motion of the player’s face. Snake Real World activates the rear facing camera. Players can also invite friends to play and share scores. The company says that this was the first time in Snake’s history that it went onto a universal channel, rather than a device preload, and it gained 121 million players around the world. To play Snake in AR on Facebook, open the Facebook app and click the camera Icon top left to open Facebook Camera. Then scroll to the Snake Mask and start playing. Which is the best game of Play station in 2014?